Conveniently take control of your health using the watches features such as; sleep monitor, Step counter, Calorie Counter, Drink Water Reminder & more! Browse the web and connect with friends on apps such as Facebook, Twitter, Whatsapp & more by simply inserting a sim card (Not Included) into the smart watch. The smartwatch can also be used as an independent Android smartphone when inserting a sim card into it. This watch is 100% compatible with Android smart phones. Connect via Bluetooth or download the APK app on your android phone to enjoy the full functionality and features of the A1 Smartwatch. Features include; Answer Calls, Dial Calls, Contact Sync, Audio Player, Camera, Calculator, Calendar, Alarm, Sedentary Reminder, Anti-Lost, Push Notifications, Text Messaging, Sleep Monitor, Pedometer (Step Counter), Calorie Counter, Remote Camera Control & More! 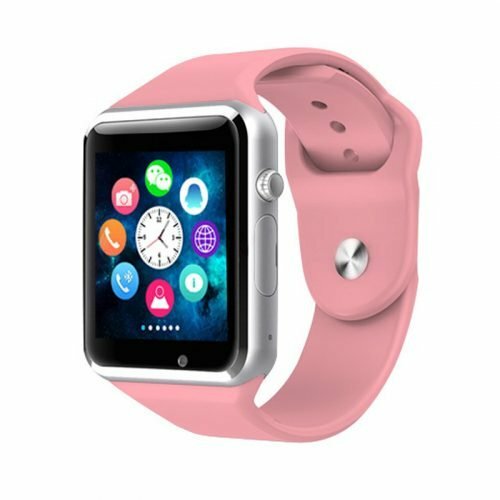 Limited functions can be used with iPhones due to the operating system however the watch is still very compatible via Bluetooth. Features for iPhones include; Answer Calls, Dial Calls, Contact Sync, Audio Player, Camera, Calculator, Calendar, Alarm, and Sedentary Reminder. Features - Built-in Camera, Message Reminder, Call Reminder, Answer/ Dial Calls, Remote Camera Control, Push Messaging, Altitude Meter, Anti-lost, Pedometer, Sleep Tracker, Calendar & Many More! HD Display - High sensitive capacitive touch screen; Perfect match technology. Functions for Android Phones - By downloading the APK app on your android phone and built the connection, you can reach functions like bluetooth call/music, Call/Message Notification and camera remote capture on the watch, also support anti-lost. Functions for iPhone - iPhone can't download the app, so functions are limited. iPhone can connect with this watch via Bluetooth to make/answer phone calls, play BT music. If you have any questions about this product by TechFaith, contact us by completing and submitting the form below. If you are looking for a specif part number, please include it with your message.